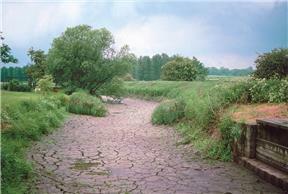 In 2006, the south-east of England suffered what was the worst drought since 1976. This came about as a result of two successive winters of below average rainfall. It is the wet winter period that fills our upland impounding reservoirs, so that the water in store at the end of the winter can maintain supply until the onset of the following wet winter. Should the winter be relatively dry, as it was in 2004/2005, then the reservoirs are inadequately replenished but still able to cope with the following summer demand. However, should a second winter be relatively dry as well, then the surface water stores begin to run dry and problems of supply begin to arise. In the east and south-east of England, surface water supplies are few and reliance is placed on groundwater, up to 70% of supply is from groundwater in some places. This is because the rocks in this area, such as the Chalk, are permeable and are able to store large volumes of groundwater, besides the relatively gentle terrain is unsuitable for impoundment reservoirs. In the few years leading up to the summer of 2006, the UK experienced atypical weather, with dry conditions in the south-east of England prompting considerable public and media interest in water resources and the UK's vulnerability to drought. The previous two years were the driest on record in England and Wales, since records began in 1767. Perhaps more significantly, from a groundwater perspective, rainfall for the previous December to March when most groundwater recharge is expected, had been at an all time low. At the end of 2004 some Chalk groundwater levels were at their lowest since 1998 and levels in most boreholes were significantly below average for the late winter. However, the residual benefit of abundant recharge, to the Chalk, over previous winters was still felt - thus levels remained substantially above winter drought minima seen previously in 1991, 1992 and 1997. Generally infiltration was very moderate in the late winter of 2004/2005, below 40% of average across much of the Chalk and in the south particularly meagre. In comparison , the recharge to the sandstone aquifers in the north and the midlands, the other major supply of groundwater in the UK, was adequate and levels remained largely in the normal range. As the summer of 2005 began, groundwater levels receded. In a borehole in the southern Chalk at Chilgrove in Sussex only during the droughts of 1855, 1934 and 1976 have lower June levels been reported. Above average July rainfall had little effect on groundwater, but may have mitigated demand. Early Autumn 2005 recharge was minimal and groundwater level recessions continued in virtually all aquifers in the south. In 2006 a dry late winter set the scene for the development of a significant groundwater drought, with even the late autumn seasonal recoveries in groundwater levels, evident in many western and northern boreholes, faltering. Of particular concern was the continuing failure of any significant seasonal recovery in substantial parts of the central and eastern Chalk outcrop. This then was the scene in 2006, during the second summer period after two poor winters. Surface reservoirs were low, groundwater levels were low. The warm summer resulted in increased demand, putting the depleted resources under even more stress. However, normal winter rains did resume in the following autumn and both surface and groundwater resources were replenished. With a careful approach to resource management and help by the general public in controlling demand, severe impacts on water supply and the environment were avoided. Scenarios do, however, suggest that under climate change the frequency and severity of droughts may be come greater in the future.